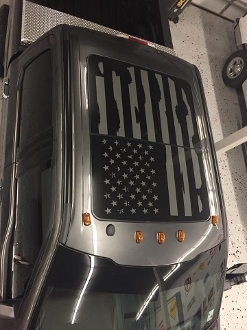 FORD F-150 DISTRESSED AMERICAN FLAG DECAL FOR THE ROOF GLASS PANEL CHOOSE COLOR. THIS DECAL SHIPS IN 2 PIECES FOR 2 REASONS, SAVES YOU MONEY ON SHIPPING AND MAKES IT EASIER TO INSTALL. WE RECOMMEND A PROFESSIONAL INSTALL THIS DECAL BECAUSE IT IS SOME WORK. IF YOU HAVE INSTALLED DECALS BEFORE, WE WOULD SAY GO AHEAD AND GIVE IT A TRY. IT TOOK ALMOST 2 HOURS TO INSTALL THE ONE YOU SEE IN THE PICTURES IN THIS LISTING. WE MAKE THE FLAG A FEW INCHES LONGER SO YOU HAVE A LITTLE ROOM TO MOVE IT AROUND AND THEN YOU JUST SIMPLY TRIM AT THE WINDOW LINES WHEN FINISHED FOR A GREAT CLEAN LOOK. IF YOU HAVE ANY QUESTIONS, PLEASE CONTACT US.